Are you the first to have kids out of all your friends? Did you recently move to a new city with your kiddos and know no one? Are you new to parenting and need to build community? Are you losing your mind with your toddler and need someone to vent to? I've been there! 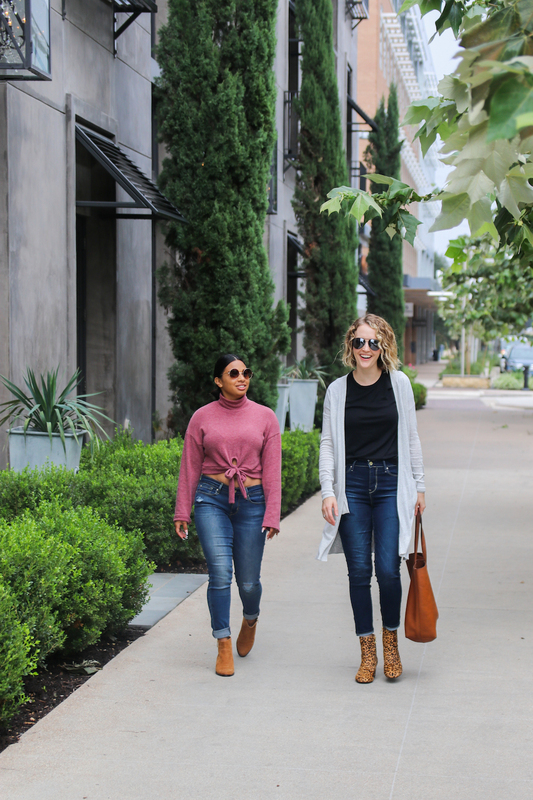 Today I'm partnering with Signature by Levi Strauss & Co. to share my tips on how to make mom friends including where to find them and how to build the relationship and maintain it. Have you ever looked at tribes or communities outside of the U.S. and wonder what life is like raising kids? Many build their homes next to their families, or even inside the same home. Their communities are tightly woven and everyone helps each other out. We lost that in most of America, but I believe there's a shift happening in modern motherhood. We are realizing the importance of a TRIBE. Friends and family who are on your side cheering you on in the good times and bad. Providing a helping hand when you need a favor. It is EXTREMELY important to have support when you are raising small children. When searching for your tribe, look first in your area. Whether you live in a house or apartment introduce yourself to your neighbors. Pay attention to the families who have kids the same age as your children. Don't be afraid to say hi and if you hit it off exchange numbers or set up a time to meet again for a playdate. My closest group of mom friends are my neighbors which I know I am very lucky to have. Join a moms group on Facebook if there is one, and if you are in a large city there are likely groups specific to your area. If you are apart of a church, there is likely a MOPS (Mothers of Preschoolers) group which you can join. I joined a MOPS group when Turner was born and loved it, but then I had to go back to work full-time and couldn't attend anymore. Parks, play places, kid-friendly restaurants, and church are other great places to meet moms. I know it can be uncomfortable meeting new people, but if you're kids are already playing together it's a great way to break the ice. Now you've established you want to hang out more so set up time to get to know each other better. It's easy to start off with a playdate for your kids, and then later you can plan a lunch or happy hour sans kids if your schedules allow it! At this point you will be able to determine if this is a friendship you want to continue. You're not going to like everyone, and not everyone is going to like you but that's OK. I think it's very important to surround yourself with positive women who add value to your life. Life is too short to make negative friends. I don't have a ton of friends, but the ones I do have I cherish. You've established you enjoy each other's company and would love to become better friends. Now how do you maintain the relationship? This is where it's tricky because we're MOMS and we're BUSY. Honestly, the main reason I have such close mom friends is because they are my neighbors and I can easily see them on any given day. We do schedule happy hours every few months, but usually we see each other at birthday parties or while we're outside playing with our kids. We are all in a group text and are in contact with each other every week. Our kids play at each other's houses. 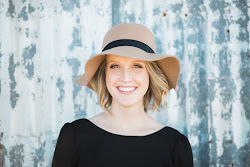 I met Vanessa a few years after I moved in to our home (she lives about 10 houses down), and I found out she is a blogger too! 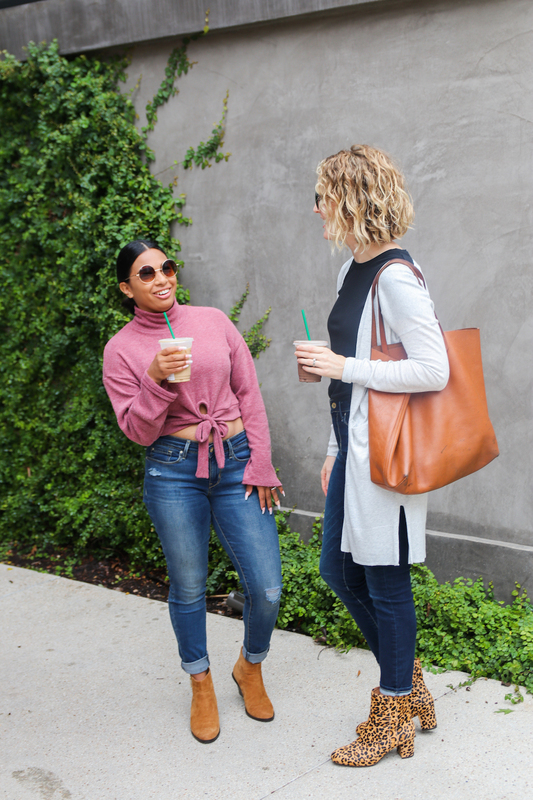 We go to a lot of blogger events together, and share a passion for writing and fashion. 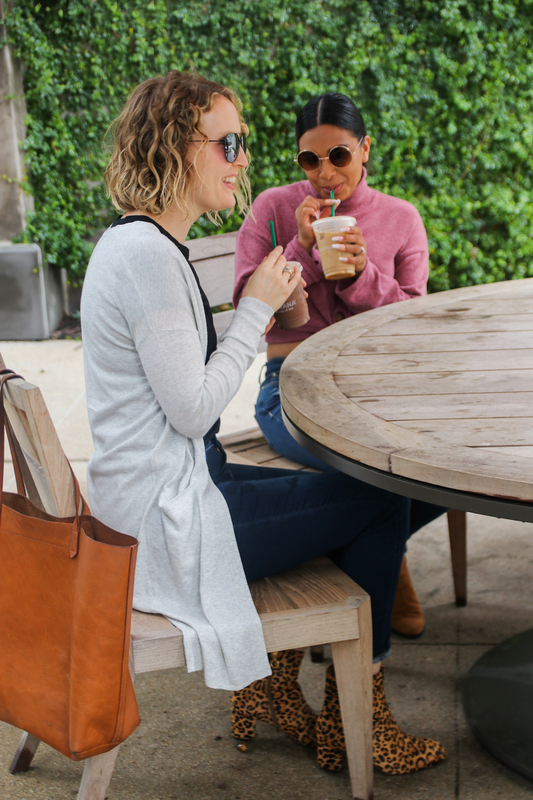 Being busy moms we need styles that easily go from playdates to coffee dates. 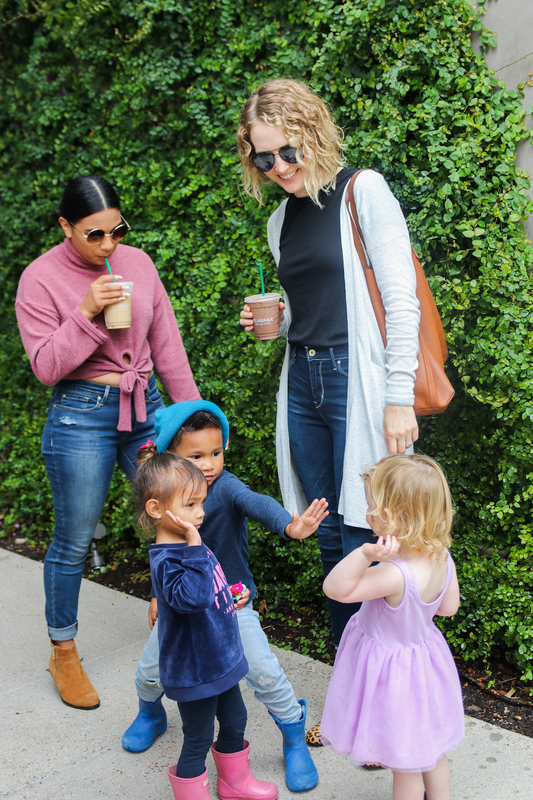 We grabbed coffee at the Domain a few weekends ago in our Signature by Levi Strauss & Co. jeans while the kids ran around. 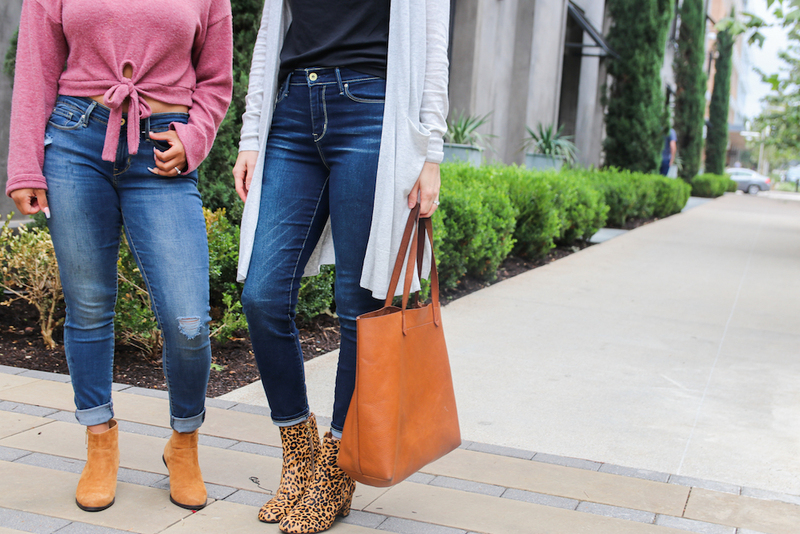 I'm wearing the High Rise Ankle Skinny Cuff jeans, which fit great and have just the right amount of stretch! 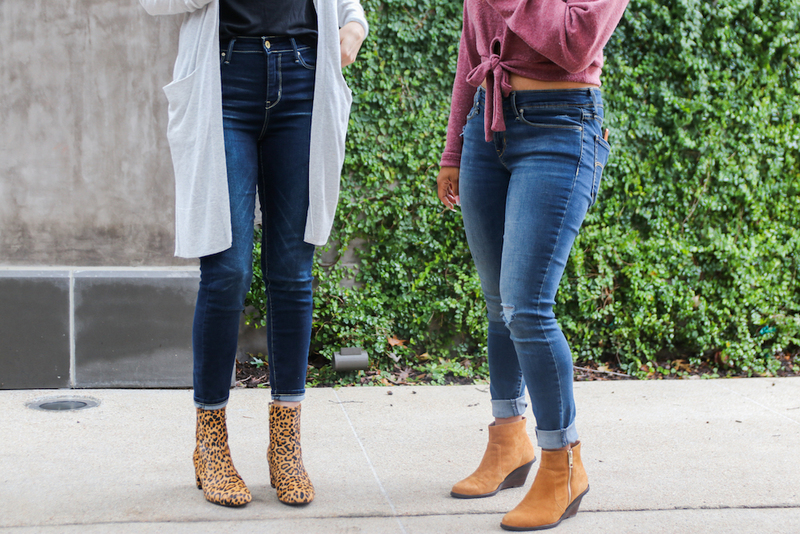 When styling high waisted jeans I like to pair them with a basic tee (front tuck always) and throw on a blazer or long cardigan for layering. My leopard boots add a fun pattern to the mix. Vanessa is wearing the Low Rise Jeggings, which are perfect for chasing kids. She has an edgy style and loves to pair her jeans with crop tops #coolmomgoals! I realize most moms don't have this same situation and if that's the case it's very important to stay connected whether it's through texting, social media (definitely add each other), and scheduling times to meet up (kids or no kids). Your happiness should be a priority in your life, and building community is part of that. Make time to be around your friends who lift you up because you know how amazing it feels after great conversation and many laughs. Share in life's greatest and worst moments together. Celebrate each others wins, and support each other during the hard days. I am an extrovert so meeting people and diving in to conversation isn't hard for me, but my advice is to step outside of your comfort zone because you never know if your new best friend could be standing right next to you! Thank you Signature by Levi Strauss & Co. for sponsoring this post!